Perfect-bound Bind-in Pockets are another great option for adding various media to any book, magazine, catalog, menu, or other printed piece. 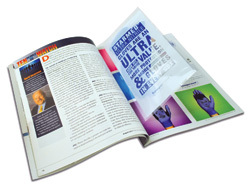 Crystal clear polypropylene, paper/poly and eco-friendly material options are available to securely hold your contents and can be printed for extra branding and interaction. Custom printing is available to enhance your bind-in and allow for an interactive application that is fun and highly appealing. Contact us to discuss custom sizes and shapes designed specifically to be compatible with your binderies’ production equipment.